Joan Perreault is a busy working mom of a 1-year-old, but she’s not letting that get in the way of her yoga practice—thanks to Ompractice. 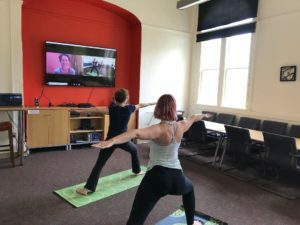 When the Northampton, MA, resident started a new job a few months ago, she was missing the great lunchtime yoga program she had at her previous company (the teacher came to their campus twice a week). So when she heard about Ompractice, she knew it was the perfect way to bring the teacher she loved to her new job. Perreault reached out to her teacher, Emily Wiadro, who loved the idea of joining Ompractice. Perreault’s bosses were also totally sold on the idea of bringing yoga to the workplace, and now Perreault has the same yoga teacher at her new job! Via two-way camera this time, of course. “We worked with Ompractice to make it work for us. My company clears the chairs and tables out of a conference room twice a week, and everyone pays individually. My company offers everyone a $200 benefit for personal fitness or wellbeing, so many of us plan to use that to cover the $5/class fee,” says Perreault. 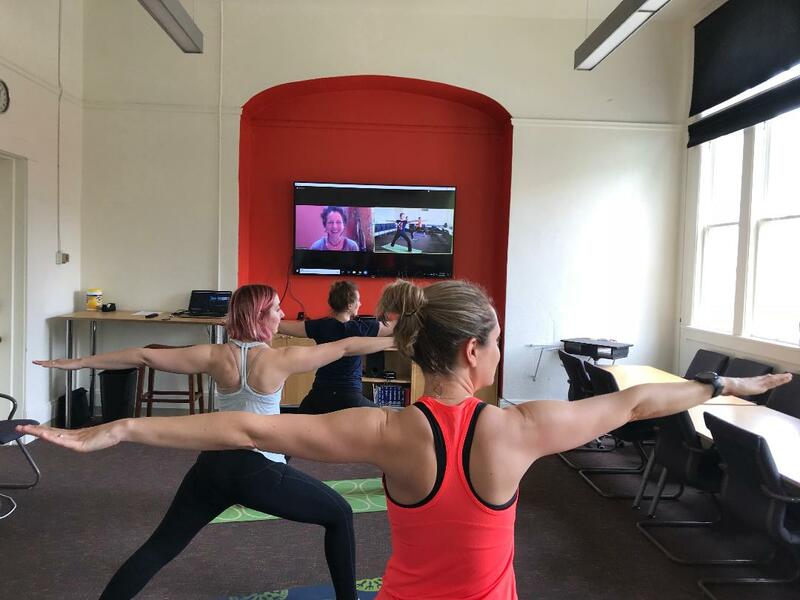 Now, about a dozen of Perreault’s co-workers participate in Wiadro’s 30-Minute Vinyasa class once or twice a week, including the president of the company! And thanks to Ompractice’s technology, colleagues around the world join in via webcam, too. Plus, the screen they use is so big that it “almost” feels like Wiadro is in the room with them, Perreault says. Interested in starting your own workplace yoga program? Perreault suggests finding key stakeholders at your company who support the initiative, then making a clear pitch.